In aerospace and automotive industries, SiC particulate reinforced aluminium matrix composites have found many application areas because of their excellent mechanical properties, combined with the ease of formability and low cost. Aim of this study is to investigate the interrelationships between wave velocities and reinforcement content, microstructure and hardness of SiC reinforced Al composites. Specimens were fabricated by hot pressing for various volume fractions of SiC particulate, up to 20 vol.%, and for different combinations of particulate size. Particle reinforced metal matrix composites have higher stiffness, strength, and wear resistance compared to the classical alloys. They also show some advantages over other composite types due to their isotropic behaviour and forming ability by conventional methods. Microstructural and mechanical properties of particle reinforced metal matrix composites are mainly influenced by the amount and distribution of the reinforcing particles. Yield and tensile strengths generally increase with increasing reinforcement content, and a similar increase is resulted for the stiffness. Ductility, fracture toughness, formability and machinability decrease with increasing reinforcement content. The sizes of reinforcing particles and matrix powder decide the uniform distribution of reinforcing particles in the matrix, consequently, strength and the ability to perform secondary deformation and machining, . In the literature, ultrasonic measurements are mainly focused on the forged or extruded SiC reinforced Al-alloys. Mott and Liaw measured ultrasonic velocity on the disks produced by vacuum hot pressing the Al-alloy powder and SiC whiskers. They stated that the inhomogeneous distribution of SiC whiskers degrading the mechanical properties is detectable by ultrasonic measurements, . Lu and Liaw characterized the anisotropic elastic stiffness on the extruded SiCp reinforced Al-alloy matrix composites by ultrasonic velocity measurements. They reported that at randomly oriented particles there was a higher velocity in the extrusion plane and a lower value in the transverse direction, . Schneider evaluated the change in volume fraction of short fibers in automotive pistons made of Al-based matrix composites by measuring the velocities of longitudinal and transversal waves, . Martin et al. correlated the changes in ultrasonic velocity and specific surface area during sintering of zinc oxide and alumina powder. Powders with narrow distribution of particle sizes showed a nearly linear relationship between the surface area reduction and the longitudinal wave velocity at the initial and intermediate stages of sintering, . Jeong developed multiple techniques to determine the volume fraction of reinforcement in Al-alloy matrix composites, including theoretical models together with the measurements of ultrasonic velocity and electrical conductivity by eddy currents, . Since the propagation of ultrasonic waves is sensitive to the variations in the microstructure and mechanical properties, a correlation between ultrasonic velocity, reinforcement content and microstructure could be established. In this study, SiCp reinforced Al matrix composites were produced by using pure Al and SiC powder. Neither heat treatment nor deformation was applied as a secondary process. The velocity of the longitudinal waves was correlated to the content and the distribution of the reinforcement, and hardness of the composites. First, samples with 0, 5, 10, and 20vol.% SiC were produced by hot-pressing the powder mixtures prepared for various combinations of 25mm and 180mm pure aluminium and 10mm SiC. 5vol.% Cu powder with an average size of 50mm was added into the mixtures. Samples were hot pressed at 590oC for 3 minutes under nitrogen atmosphere. 40MPa pressure was applied till the temperature of the sample reduced to 500oC to avoid shrinkage porosity. Microstructures were investigated by optical microscopy. After density measurements, the velocity of the longitudinal waves was determined using Panametrics-5052UAX50 analyser, Philips-PM3365A oscilloscope, and the 5 MHz probe having 12.7mm diameter. The ultrasonic velocity was calculated by dividing twice the specimen thickness by the time-of-flight between zero-crossing of two back-wall echoes. Oil was applied as a coupling medium at the probe-specimen interface. A constant force was applied on the probes to obtain a stable thickness of the coupling film. The average velocities were obtained by averaging the five independent measurements. Brinell hardness was also measured on the samples. 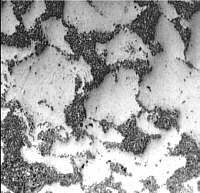 The photomicrographs in Figure.1 indicate that the particle sizes of Al and SiC affect the distribution of SiC particles in the matrix. A more uniform distribution was obtained when their sizes are close to each other. When coarse Al powder was used, SiC particles clustered and appeared as a continuous network surrounding the aluminium particles. The clustering tended to increase at higher SiC-contents. Fig1: Photomicrographs of some samples for 20 vol.% SiC (the dark particles represent SiC). Figure.2 shows the variation of longitudinal ultrasonic velocity with respect to the SiC content for various size combinations of the constituent particles. An increase in the SiC content results in a corresponding increase in the propagation rate of the longitudinal waves. Fig 2: Variation of the velocity of longitudinal waves with respect to SiC-content for various combinations of the particle size. Similarly, for a given SiC reinforcement content, some differences in the hardness values were observed depending upon the particle size of the constituents. These results indicate the interrelationship between ultrasonic velocity and hardness. Fig 3: Variation of hardness with respect to vol.% SiC for different particle size combinations. It is clear that SiC clusters or porosities should not be present in the composite to achieve good mechanical properties. A higher Al/SiC powder size ratio may lead to a highly segregated structure. 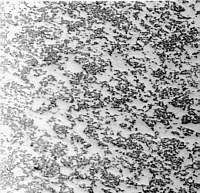 When a size ratio of 180/10 was used instead of 25/10, SiC particles segregated around the 180mm Al particles are seen in Figure.1. At higher amounts of SiC, the uniform distribution of these reinforcing particles in the matrix has a considerable influence on the ultrasonic velocity. When the values corresponding to 20vol.% SiC are correlated, it is seen that the ultrasonic velocities of the samples with 25mm-Al are higher than those of 180mm-Al. However, this difference decreases, when the SiC vol.% is reduced to 10% or less. It can be said that the micro-porosities in the highly segregated specimens affect the ultrasonic velocity. To confirm this statement, density values were compared. For instance, the densities of samples with 25mm-Al and 180mm-Al for 10vol.% SiC are close to each other (2,79 and 2,77 g/cm3). However, those values for the case of 20vol.% SiC show a higher difference (2,85 and 2,78 g/cm3). The samples prepared from coarse Al powder did not reach its full density above 10vol.% SiC. In literature, for alumina ceramics, a proportional decrease in ultrasonic velocity with increasing porosity was reported, . Beside, a model to predict the variation of ultrasonic velocity as a function of pore vol.% was proposed, and reported approximately 10% reduction in the ultrasonic velocity of SiC for a small range of pore volume fraction, . Therefore, an ultrasonic velocity below the expected value is a sign for the presence of highly segregated structure, i.e., micro-porosity. SiC content can be determined by measuring the ultrasonic velocity. For a given particle size combination, the velocity of the longitudinal waves increases as SiC vol.% of the composite increases. The particle size ratio of the constituents becomes an important factor for ultrasonic velocity, especially above 10vol.% SiC. A higher Al/SiC particle size ratio results in segregation of SiC particles along the Al powder boundaries. This yields lower ultrasound velocities with respect to the homogeneously distributed reinforcement. Therefore, an ultrasonic velocity value that is less than the expected one might be attributed to the micro-porosity in the segregated structure. Similar tendencies were also observed for the results of hardness tests. A.R.Begg, Metal Matrix Composites by Powder Metallurgy, Powder Metallurgy, Vol.36, pp. 107-110, 1993. G.Mott and P.K.Liaw, Correlation of Mechanical and Ultrasonic Properties of Al-SiC Metal Matrix Composite, Metallurgical Transactions A, Vol.19A, pp. 2233-2246, 1988. Y.Lu, P.K.Liaw, Effects of Particle Orientation in SiC Particulate Reinforced Aluminium Matrix Composite Extrusions on Ultrasonic Velocity Measurement, Journal of Composite Materials, Vol.29, pp. 1096-1115, 1995. E.Schneider, Ultrasonic Characterization of State and Properties of Al Structures, Proc. of 7th European Conf. on NDT-Copenhagen, Vol.1, pp. 493-500, 1998. L.P.Martin, D.Nagle, M.Rosen, Effect of Particle Size Distribution upon Specific Surface Area and Ultrasonic Velocity in Sintered Ceramic Powders, Materials Science and Engineering, Vol.A246, pp. 151-160, 1998. H.Jeong, Multiple NDE Techniques for the Measurement of Constituent Volume Fractions in Metal Matrix Composites, Res. Non-Destr. Eval., Vol.9, pp. 41-57, 1998. L.S.Chang, T.H. Chuang, W.J.Wei, Characterization of alumina ceramics by ultrasonic testing, Materials Characterizaiton, Vol.45, pp.221-226, 2000. A.K.Mukhopadhyay and K.K.Phani, An Analysis of Microstructural Parameters in the Minimum Contact Area Model for Ultrasonic Velocity-Porosity Relations, J. of European Cer. Soc., Vol.20, pp. 29-38, 2000.